Hawker Siddeley announced their plans for a short-range, quiet airliner powered by four small turbo-fans in August 1973, the 146. But, with the economic recession in Britain that fol-lowed shortly after, the HS. 146 project became “unjusti-fiable” and was dropped. It was re-launched five years later when Hawker Siddley became British Aerospace (BAe). Design of the BAe-146 included 15 rows of five-abreast seating, and it was powered by four Textron Lycoming ALF502R-5 high bypass turbofan engines of 6,970 lbs of thrust. The British Aerospace 146 first flew at Hatfield on 3 September 1981, flown by chief test pilot Michael Goodfellow and Peter Sedgwick, and two flight test observers. At the time of the first flight, which lasted 95 minutes, BAe reported that it had 35 aircraft "earmarked for customers". The -200 development production model flew on 1 Au-gust 1982. The main point of difference between the -200 and the-100 was the increased fuselage length of the -200 by 2.40m to 28.60m. 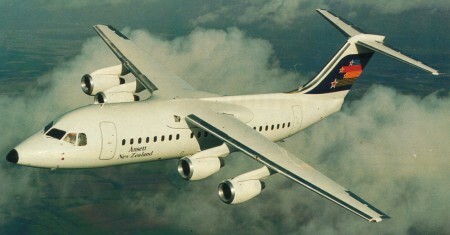 The type was granted certifi-cation on 4 February 1983, and production went ahead, with assembly of the BAe-146 beginning at Hartford and later expanding to Woodford. Annual production of the airliner reached 40 aircraft, and one of the first operators of the type was Dan-Air in Britain, which began operations with it in May 1983. QT Quiet Trader and QC convertible versions with side-opening freight doors were also available. The QT suffix under-lines a marketing ploy; "Quiet Trader”. The -200QT combines the wide door introduced on the freighter versions with interior trim appropriate to the passenger role and has a within one hour turnaround between roles; providing either 94 seats or room for six freight pallets. The prototype QC had made its debut at the 1989 Paris Air Show. With a strengthened floor that enable pallets of up to 4000 lbs (1.815 tonnes) providing a possible gross payload of 10.05 tonnes to be shifted, with a 42.184tonne MAUW permitted. The name Statesman refers to VIP-furnished variants for military or civil customers. A further development, the BAe 146-300, made its first flight on 1 May 1987 and certification was granted on 6 September 1988. This had its fuselage lengthened again to 30.99m, seating around 90 passengers five abreast, and an upgraded “glass” cockpit, but the power plant remained the same. Late in 1990, BAe offered the first of an improved series called the RJ70, and this was followed over the next two years with the RJ80, the RJ85 and, in May 1992, the RJ100. The RJ-100 (G-IRJX) first flying on 23 Sept 2001. However, the RJX programme was eventually closed, marking the end of commercial jet airliner production in Britain. In all, a total of 380 BAe-146s were produced and the type has been in worldwide service. Engines: Four Avco Lycoming ALF 502R-3 turbofans, 6,700 lb st (3 040 kgp) for take-off. Balanced take-off field length, 3,600 ft (1097 m), ISA at sea level. Max zero fuel weight, 63,250 lb (28 690 kg). Standard seating, 100 at 33-in (84cm) pitch. Underfloor baggage/cargo capacity, 660 cu ft (18,69 cu.m). Engines: 4 x Avco Lycoming ALF502R-5, 6970 lb thrust. Engines: 4 x Textron Lycoming LF507, 7000 lb thrust.